As I (very slowly) packed up my Brooklyn apartment, my mom came into town for one last NYC hurrah. As a dedicated Food Network viewer, she arrived with many “Have you heard of X Y or Z? !” suggestions—many of which I, of course, had heard of…except for Falai. We headed over right after work and so it was no surprise to walk into an empty restaurant. Once seated, the waiter came by with a tray of various breads. Now, our reason for choosing Falai in the first place was Chef Iacopo Falai’s notable stint as Executive Pastry Chef at Le Cirque 2000, so our expectations were high. 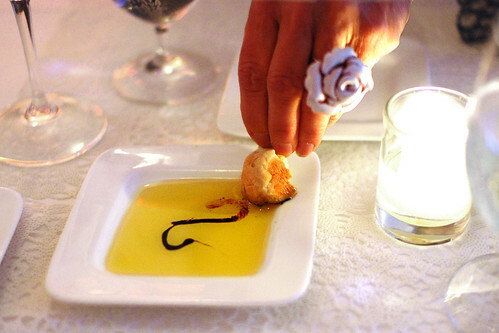 Two petit brioche nuggets were plucked from the tray and served with a shallow dish of olive oil and balsamic. The brioche was—dare I say—perfect! Like a buttery bonbon, we savored the sweet morsels and prepared for the next course: more bread! After placing our order, the bread monger reappeared and offered us fresh Pane Dolce wrapped around sweet onions. 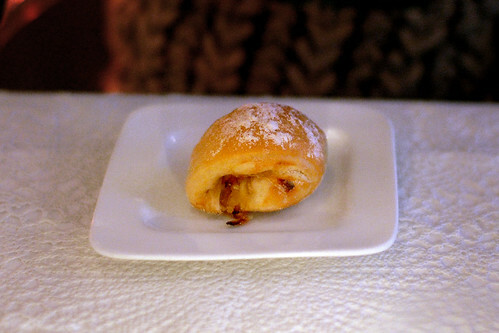 Like a savory rugelach, we nibbled through the rich, flaky spiral toward ribbons of sweet white onion. Sending happy throughts into the kitchen! A clear plastic shot glass (you know, the kind that jello shots look pretty in) of Yellow Watermelon soup arrived next, garnished with a floating drop of chive oil. Served cold, we knocked back this refreshing amuse bouche as the waiter presented us with our first real dish – only it wasn’t what we ordered. The kitchen sent us a lovely work of art they called a Lobster Bisque. 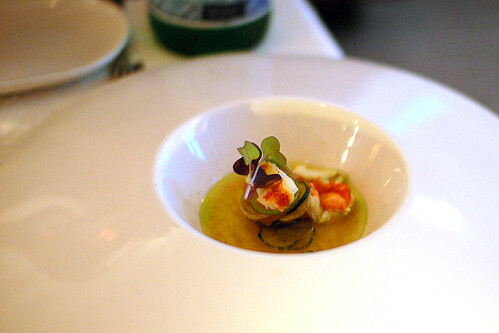 Though I could not personally partake, I’ve never seen a lobster bisque as florally garnished as this. Chunky dollops of lobster flesh float in a light stock with razor thin medallions of vegetables, piled high like the Leaning Tower. My mom was perfectly content not sharing this dish with me. Finally, 30 minutes into our meal, our first “from the menu” dish arrived. The freshly foamed Insalata de Fagiolini ($15) is a play on various forms of softness. 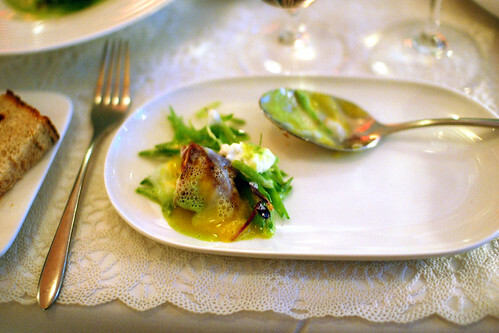 At the base, a handful of French cut sugar snap peas rests in a glistening puddle of string bean cream. With our fork, we ruptured the gently poached egg, allowing the mustard colored yolk to ooze over the dish like a slow moving lava flow. 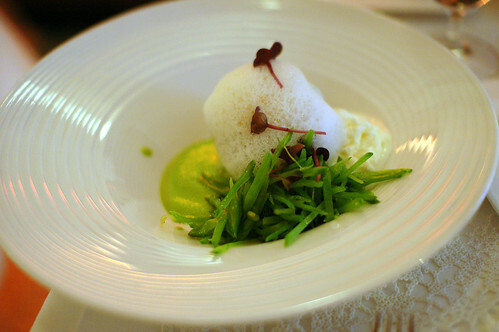 Atop all this, the pristinely pale sheep cheese foam quietly popped. I feel like I say this a lot, but as a vegetarian, I’ve eaten more pasta then anyone, anywhere, really should. Still, I’d happily suffer through yet another mediocre plate of gummy gemelli and soggy farfalle to find something transcendent. I’m pleased to announce I’ve discovered such a dish in Falai’s Gnudi ($18). These walnut-sized rounds are sometimes lumped into the gnocchi family, but this delicate ricotta and baby spinach dumpling bears more resemblance to naked ravioli than potato gnocchi. Imagine taking home a plump ravoli and slowly peeling back its outer layer, removing its crinkle-cut shoes and sliding the ricotta filling into a brown butter bubble bath of crema di latte and crispy sage. This is the kind of dish you want to come home to every night. 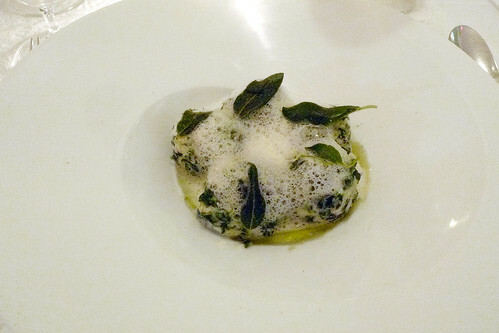 Not to be overlooked, the postmodern Agnolotti ($21) screams with flair and Tibor Kalman-inspired style. 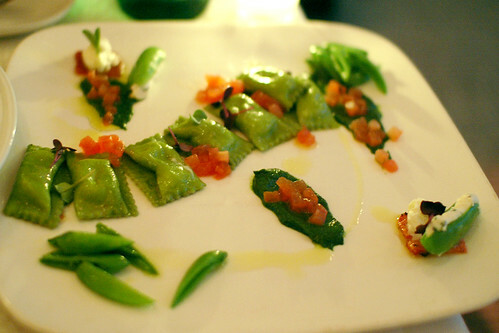 Served on a flat white dish, it consists of spinach pasta filled with sheep milk ricotta, dancing through a boogie woogie arrangement of burrata-stuffed sugar snap peas, with smears of spinach puree and tomato confetti. 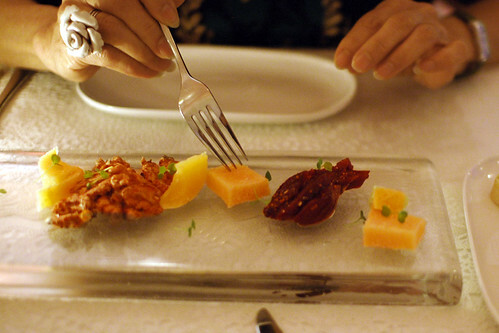 Alongside this plate, a long stemmed glass of “tomato water” stands waiting to be sipped with each bite. We quickly devour our pasta, and being the devout vegetarians we are (my mom is not actually vegetarian, but she indulges me whenever we eat out), we skip the secondi course and head straight to dessert. 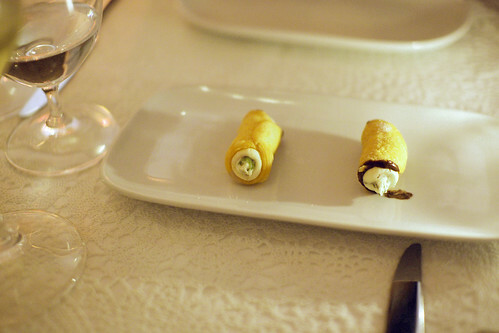 To ease the transition, we are offered yet another complimentary dish—two mini cannolis. The tiny shells are piped full of sugary white frosting and accented with chocolate or pistachio. Though we could have crammed an entire cannoli into our mouths, we nibbled at them like ladies so we can compare the flavors (they both tasted the same). 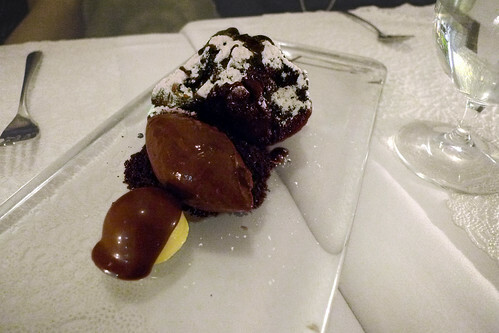 I know to some people… most people… dessert evokes decadent chocolate explosions. To me, however, dessert is an opportunity to explore sweeter sides of the savory foods and cheeses I love. 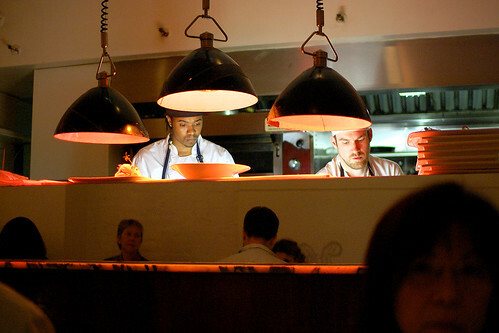 Falai takes care to thoughtfully pair their cheeses with complementary and skillfully prepared fruits. Admittedly, I’ve been known to order cheeses based simply on their pairings. Perhaps it’s a bit superficial of me, but I see no problem in viewing cheese as an accent to fruit. So for this plate I selected both the Piave (Veneto) served with balsamic reduction and poached figs, and the Pecorion Toscano (Toscana) with a red wine reduction, candied walnuts, and poached apricot. 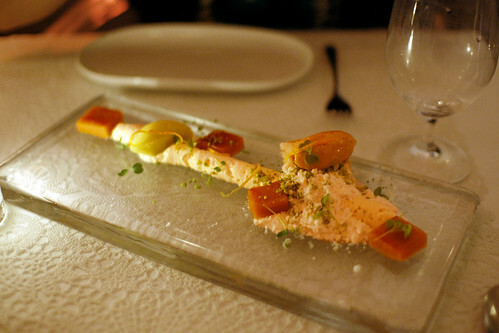 But hey, I can’t totally reject the art of sugary desserts, so I also ordered the Composizione di Caramello ($11). I was presented with a glass block containing a mysterious vapor trail of whipped cream, ending with a snowy bank of milk powder. Anchored by two quenelles of green apple sorbet and caramel gelato, the dessert is flecked with caramel cubes, pine nut dust and (strangely) micro greens. The surprising lack of sweetness, or really any flavor, made me feel this was a waste of money. Welcome to the end of my meal! That being said, after all the exquisite bites we enjoyed during the meal, I felt no desire to carp about money! Thinking our meal is over, our bill arrived with two unexpected guests: a honey soaked cookie with ricotta and a hunk of red velvet. Both were better than our actual dessert! Still on my high horse—preaching the word of Falai throughout Manhattan—I promised a divine meal to my friends Amanda and Lori. 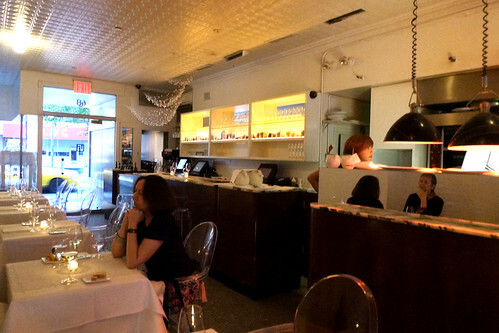 What’s more, I made the reservation through Village Vines, getting 30% off the entire bill. 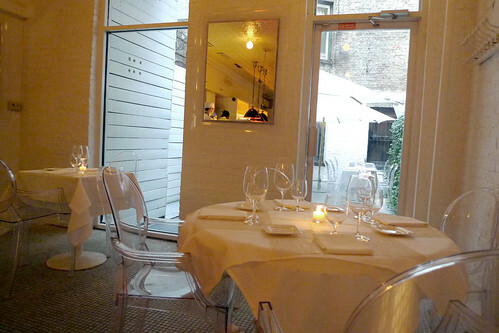 We arrived at Falai’s familiar crystalline dining room, and like before, were presented with artisan breads. The flavors remained a mystery since the server didn’t know what they were – after conferring with the manager we learned they were olive, cavolo nero (Tuscan kale), and plain. Served slightly cold, and disappointingly bland, my friends seemed less then impressed. 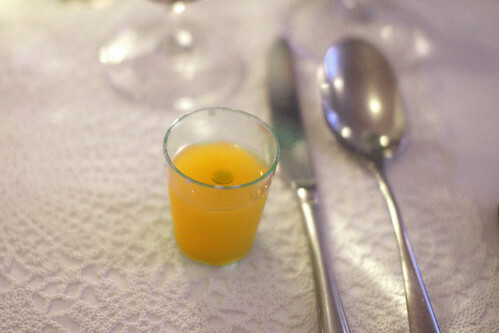 Right on schedule, a creamy shot glass of Cauliflower soup arrived after placing our orders. 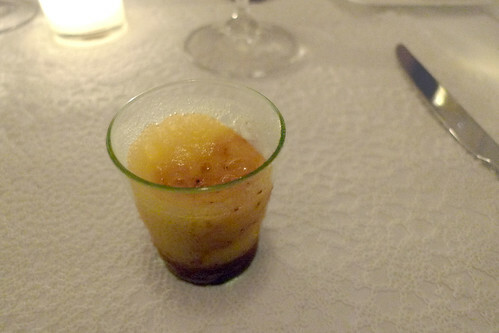 Unlike the juicy melon soup on my last visit, this dense puree languished in the cup no matter how far we tipped it and scurried away from our seeking tongues as was we waggled them in the plastic. Not to say it wasn’t delicious, but we could barely access half the portion. Unlike my last visit, this is where the freebies stopped – every subsequent dish was exactly what we ordered (and paid for). I am art? I am salad? 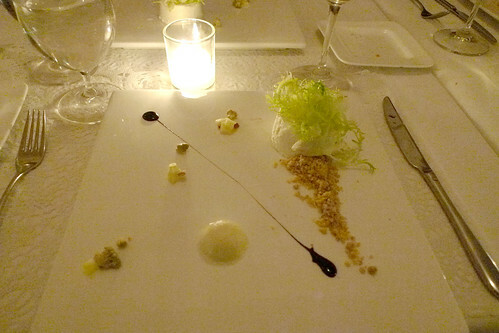 I ordered a scoop of Bufala Ricotta Flan ($15) topped with a frisée toupee and pine nut crumble. It was paired with microscopic cauliflower florets, pebbles of candied apple, and an anorexic streak of balsamic reduction. 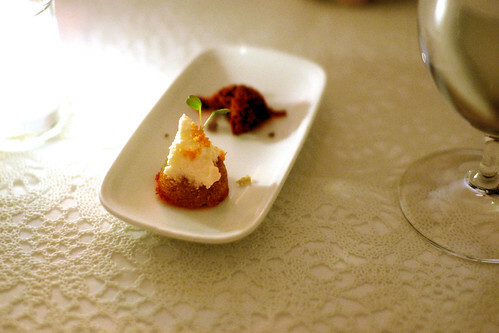 The rich, creamy texture of the dish nearly overwhelmed me, but the flan was saved by its airy consistency. The Insalata di Pomodoro—a chunky composition of heirloom tomatoes and cantaloupe—arrived next. 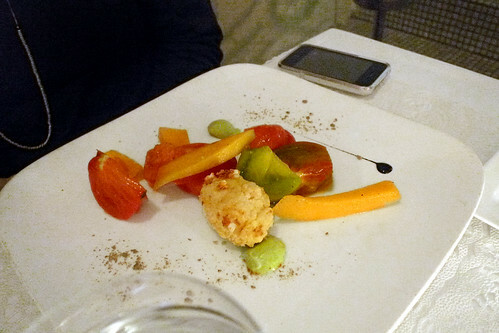 Unlike the artful compositions from my previous visit, the success of this dish rests solely in the quality of produce. The menu states it comes with a burrata and tomato crumble but I couldn’t detect either in the nugget adorning the salad. Nonetheless, the produce was crisp and juicy. 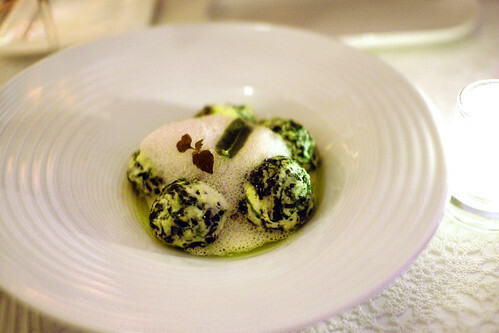 At least the Gnudi was exactly the same—delicious! Wrapping up an unexpectedly mediocre meal, my lady friends chose the Chocolate Brioche for dessert—a marked improvement over the Composizione di Caramello I struggled through on my last visit. Still, it amounts to little more than a birthday cake with ice cream – albeit, a fancy birthday party! I, however, might pass on the invitation next time.